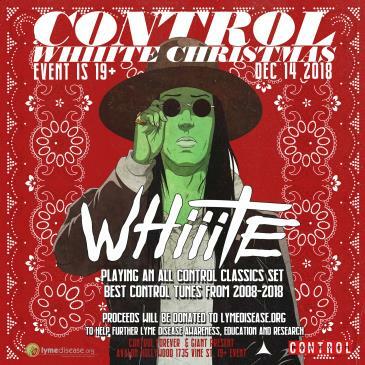 Christmas season has finally hit and what better way to give back to the community than dancing the night away with Whiiite at AVALON Hollywood for a great cause. On December 14th, all proceeds from this edition of CONTROL Fridays will be donated to LymeDisease.org to help further Lyme Disease awareness, education, and research. Producer/DJ Chris White, better known as Whiiite, is well known for his heavy-hitting electro house and hip hop style. He’s gained recognition from a wide range of industry staples including Skrillex, 12th Planet, and Missy Elliot to name a few. In addition to his musical talent, he’s also developed some striking visual components that he incorporates into his craft. Over the years, he’s worked to create a superhero persona that syncs up with his EPs to tell the grand stories of Whiiite. The stories are presented as a graphic novel and explore powers, villians, trials, and more. Whiiite’s sets are more than just music - they’re immersive visual experiences that one won’t see anywhere else. Whiiite will be playing an all CONTROL classics set on December 14th to take the audience through a journey back in time. He'll be throwing in his personal style on tracks that filled AVALON all the way back in 2008. Come out to support LymeDisease.org and be amazed by the wonders of Whiiite.